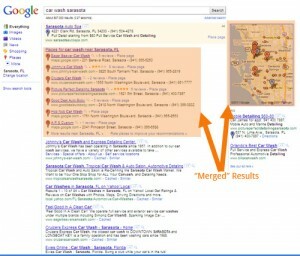 While Google Places is most important if you’re serving one or more local markets, every business should have (and use!) at least one listing on Google Places. If you don’t have yours set up yet, these instructions will help you get started. One you have your listing, however, how do you make sure it has good positioning in the search results? What is an “Anchor Text” Link? Here’s a quick primer on the 2 basic types of links you can create (or receive) on the web. To illustrate, I’m going to refer to the product we recently released: The Ultimate Small Business Growth Kit in a Box …Without the Box! Now… that’s an effective link (please feel free to share it with anyone & everyone! ), but it’s a little lengthy and not very pretty… wouldn’t you agree? A more appealing way to create the link is to use “anchor text.” Anchor text is the term for the word or phrase that is linked to content on the web. In the link above, there is no anchor text (OK… technically there is, but it’s identical to the URL so we won’t count it). So here’s what a link might look like using anchor text: Please check out our incredibly valuable real-world marketing training for the 21st Century Small Business. When you’re creating (or receiving) links on the web, the links will be of more value if they are anchor text links. The key is: the anchor text should be the phrase you’d like to see your content rank well on in the search results. So… if you have a pest control business in Topeka, then you might want your Google Places page to rank well on the phrase “pest control Topeka.” In that case, you’d want other websites to link to your Google Places page using that phrase as the anchor text. Make sense? Search for your business on the map by going here. In our case, http://maps.google.com/maps/place?cid=17650561483947767278&q=blablablablablablabla with a whole bunch of characters and stuff afterward. If the anchor text for us is “small business marketing strategists,” then here’s what a link would look like: small business marketing strategists. In the case of one of our good friends here in town, it might be acupuncture Sarasota. This little-known secret about the actual URL for your Google Places page can be incredibly helpful… we’ll talk more about this in a future update! Feel free to post your questions in the comments. Is it better for your rankings to link to the places page with good anchor text or is it better to link to the normal homepage of the website with good anchor text to rank high on Google Places? What is the most effective situation? Great questions! This isn’t really an “either/or” situation. Without good content, neither the Google Places page nor the website will rank well. So… the keyword phrase(s) you’re targeting need to prominently appear in both the website and the Places page. Once that’s in place, anchor text links to the website itself would be my first priority. You definitely need to verify that the website URL listed in the Google Places page matches up to the website you are trying to rank. Then, some anchor text links to the Google Places page as we’ve described here will help things along. There are certainly other factors… reviews (directly on Google Places as well as on other sites that Google is likely to pick up on as we described in this webinar on local business marketing) will be helpful as will strategic categorization of the business in Google Places. Adding images and YouTube clips to the Google Places page have all had a measurable impact as well.